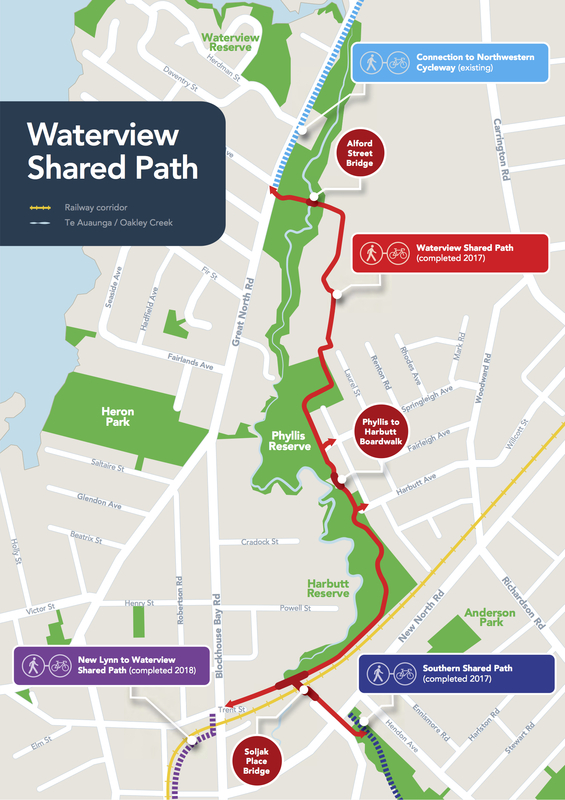 The Waterview shared path route – from the Auckland Transport information page. We have our own beast of concrete being built nearby. Transmission gully; it’s going to increase the bird population at our house as a possative spinoff, from all the landscape gardening going on around it. I'm looking forward to getting an electric car for hooning along it. The only emissions will be from the tyres, which the motorway will catch most of in the filter ponds. Same. It's impossible not to be impressed by how it's been executed. Sadly, experience have shown that such things typically improve traffic for a brief time, then people adjust their plans accordingly (e.g. commuting by car from Otorohanga or wherever Auckland's outer suburbs are now) and the roads fill up again. Most European cities (even London) called a halt some time ago and have motorways stopping on the outskirts. Sadly, experience have shown that such things typically improve traffic for a brief time, then people adjust their plans accordingly (e.g. commuting by car from Otorohanga or wherever Auckland’s outer suburbs are now) and the roads fill up again. The lack of provision for bus lanes certainly hasn't helped. But there were some special circumstances here. There's currently an almost-completed motorway network, and people complete it by transiting through suburban streets that really aren't made for it. It also connects to the "other" harbour crossing via Greenhithe, which lets traffic get to Albany without going near the CBD. I think there's going to be a substantial shift of airport traffic once it opens. People coming from the north will choose SH16>SH20 rather than enduring the southern motorway. 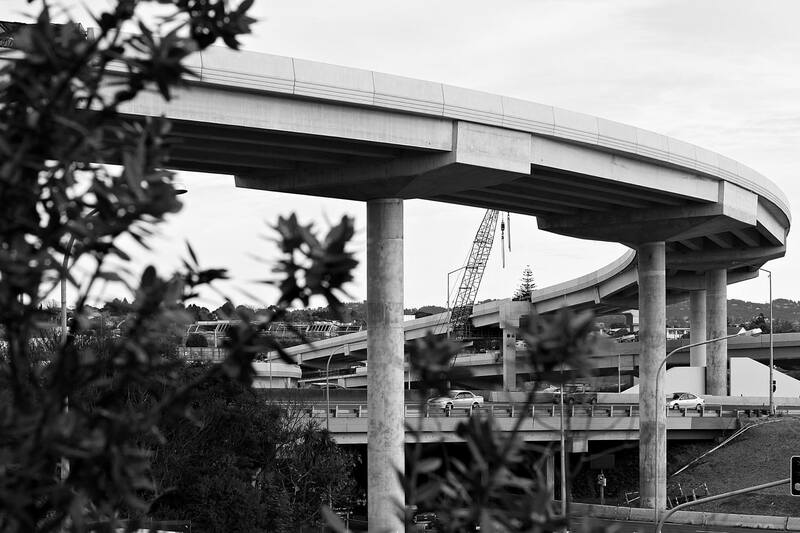 And there's going to be a lot of pressure on the St Luke's Road interchange by Western Springs. Wow. As an outlander, I had no idea of the massive scale of the works. I thought it was a tunnel with a strip of widened fast road. Same. It’s impossible not to be impressed by how it’s been executed. It's also quite something to do a drive through practically every day of this enormous and long project. My boys have seen a suburb transform into a gigantic public work. We comment daily on the latest addition. Good practice for training the eldest's eyes. I still feel the slight twinge that in all of this work, the ability to have one tiny little bit of lane dedicated to bicycles that don't want to go up to Pt Chev, cross a very busy road and then back down again through a golf course was somehow lost. They built lanes for trucks to access the works about 6 times during the process and every time my heart would leap! Could this be the bike lane? But no, it's pretty clear now that the concrete cliff where that lane would go is final. Biking infrastructure has essentially remained unchanged on the south side (where the cycleway is). This is a pity because it was not good infrastructure in the first place. Up to the area and going out of it were pretty good, but the connection through is not. It seems that won't be changing. Interesting that there's to be a new bridge crossing Oakley Creek. Nice for people out for a walk anyway - on a bike that's one hell of a climb if the crossing is down near the creek. Will be very interested to see what becomes of it. Interesting that there’s to be a new bridge crossing Oakley Creek. Nice for people out for a walk anyway – on a bike that’s one hell of a climb if the crossing is down near the creek. Will be very interested to see what becomes of it. Nope – it’s a high bridge. This is the platform it'll be built from. 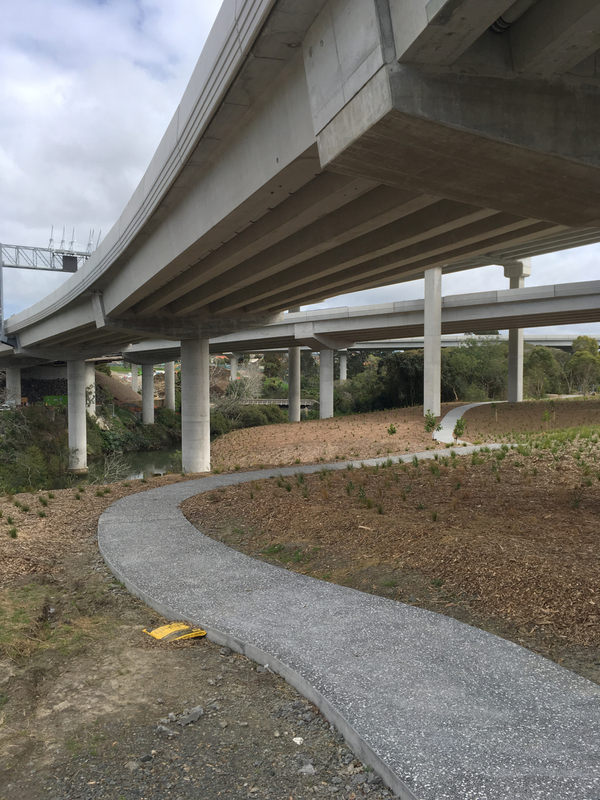 A yet-to-open path under the ramps to the park in Waterview. I’m told residents insisted on steps to access the bridge in the distance, to slow cyclists down. Bah. 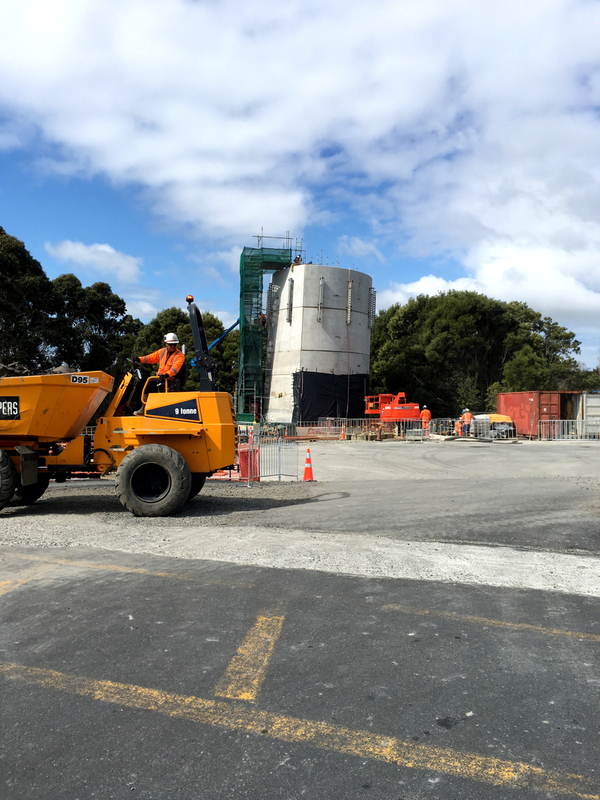 And there’s going to be a lot of pressure on the St Luke’s Road interchange by Western Springs. Which they’ve managed to bollox up when it comes to the St Luke's Road offramp. It used to have a long queue turning right, and they fixed that by having two right hand turning lanes into three lanes on the bridge (1 left, 2 right). Now the queue is on the left turn because they replaced the free-turn & merge with a give way. Also, it doesn’t look like they are going to do anything about Duncan Maclean Link which will likely be mostly unusable turning right to get to the motorway as the new traffic islands reduce the distance available for merging. I do agree that the scale of the Waterview Tunnel is extremely impressive. 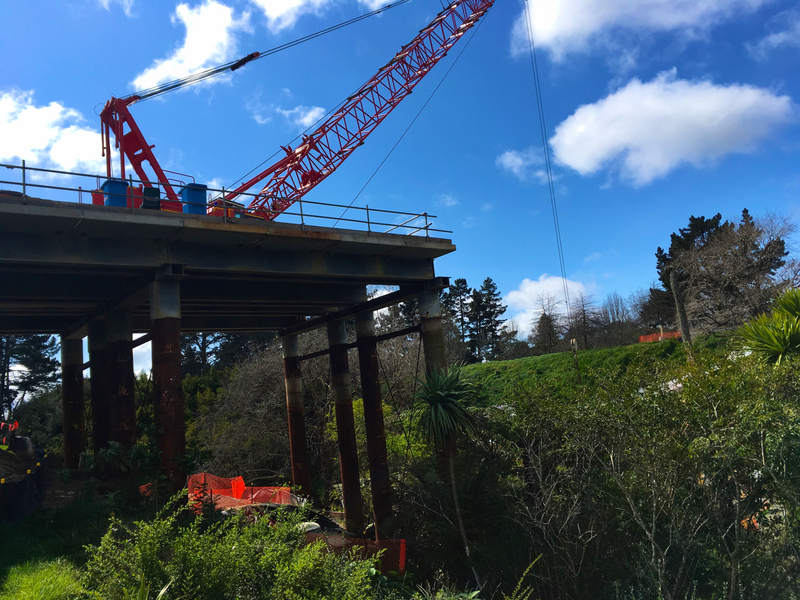 It’s certainly going to make life easier getting to the Onehunga or the airport – no more traipsing through Sandringham. In the artists impression it looks nice and high. Oh, that’s interesting. The pic I took above is very different-looking. Is it the platform from which to build the actual bridge, or did something change? UPDATE: My pic is the platform the bridge will be built from – they're trying to minimise disruption to the creek below. A yet-to-open path under the ramps to the park in Waterview. I’m told residents insisted on steps to access the bridge in the distance, to slow cyclists down. and make it unusable for wheelchair users, who clearly have no right of access. Sigh. Apparently it wasn't just the residents. But yeah, what a bummer. Courtesy Max Robitzsch – this is how the greenway connects to Great North Road. this is how the greenway connects to Great North Road. Ugly... considering for a fraction of percent more on the total spend they could have put a Te Atatu style underpass in here. It all looks very 1970's. My grandparents lived near the Western Springs section of the NW motorway and we used to climb the massive piles of scoria during construction. We literally got told to "go and play on the motorway"
Cool, so it's really a crossing over to Unitec? I couldn't tell from the map picture. I wonder what the justification is - that looks like quite an expensive work. Presumably it's also possible to just go onto the offramp as a vehicle, stop at the lights, and then turn with the traffic? I always ride on the road at that point anyway, because the cycle path ends at the lights under the bridge. 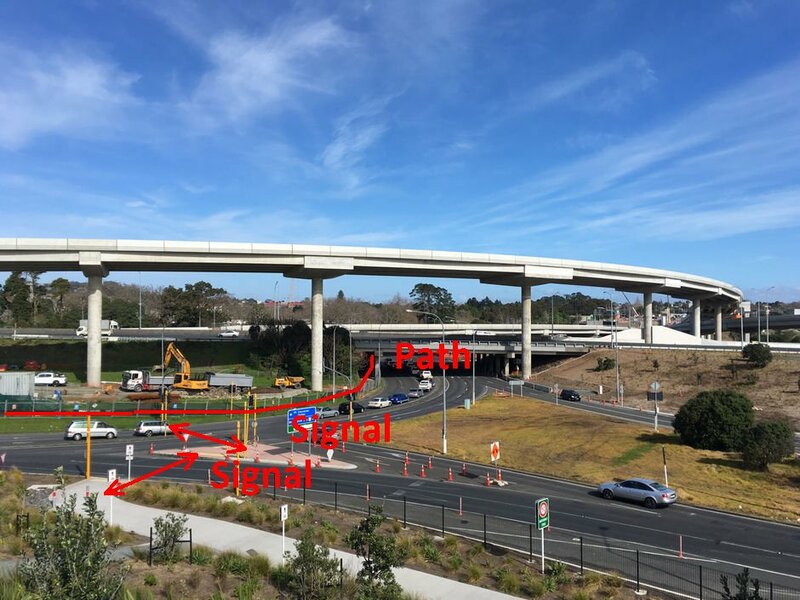 Which is fine if you're going on the NW cycleway, but if you're going up Gt North Rd, you either go on the road, or you cross at the lights and then over the on-ramp, then you go up the bridge and down the other side, and then do a U-turn. Which would be safer, definitely. My fear on the road is not my right to be there, which is unassailable, but the safety of effectively crossing the on-ramp onto Gt North Rd with the traffic behind me coming at motorway speeds. Haven't died yet, though. I just ride big, and get out of the way as soon as practical (almost immediately). +1 for the open day concept!! Work to date has certainly been incremental improvements to my car commute in from the West, Waterview no longer the carpark it was for a looong time and heading home the extra lane to help merge the people heading north from St Lukes to the Waterview exit has been huge. The bike path bypassing Great North Rd looks good for my future self too. That stretch of double lane traffic and grumpy drivers is a major cycling downer. Ugly… considering for a fraction of percent more on the total spend they could have put a Te Atatu style underpass in here. That would have been so much better. Still, I think there's to be a direct path down from your old shop on the GNR- Carrington corner, which is good.